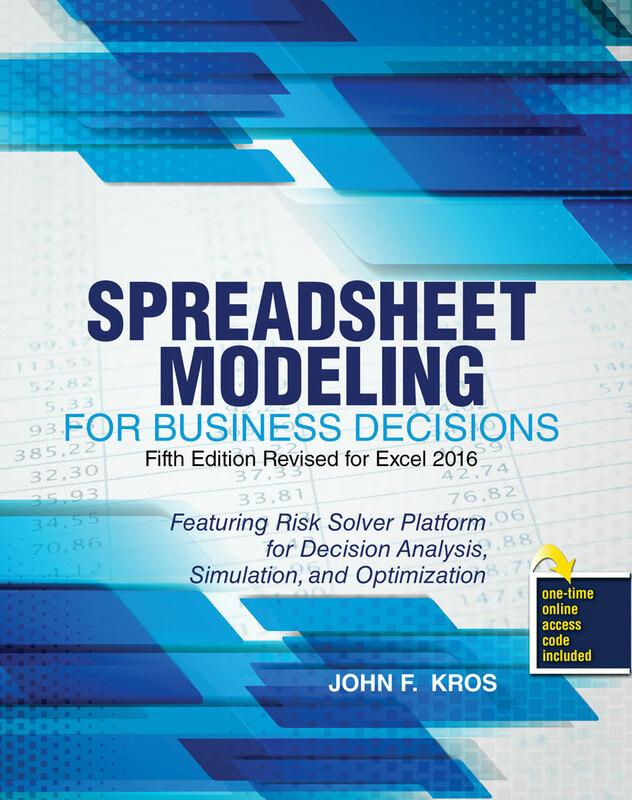 Updated for use with Microsoft Office Excel 2016 with an emphasis on model formulation and interpretation rather than on computer code or algorithms, Spreadsheet Modeling for Business Decisions examines the core methods used by managers in their everyday problem solving situations. This text provides the reader with a process to improve their own critical thinking, management judgment, and communication with their end-user clients. Spreadsheet Modeling for Business Decisions focuses on five fundamental topics of quantitative business decision making and management science, making it suitable for a survey course in management science, but specific enough to satisfy upper division “elective” courses and graduate level MBA courses in quantitative methods or business decision making. Includes a new chapter on inventory modeling and incorporates the Analytic Solver for decision analysis, simulation, and optimization. Features examples, as well as exercises, that guide the reader in forming their own decision making process, understanding the output from their analysis, and communicating that analysis in written and verbal form. Includes an enhanced online learning package featuring: supplementary software programs, such as Analytic Solver, Treeplan, @Risk, and other add-ins for spreadsheets; integrated case studies, decision tree add-in programs, video lectures, interactive quizzes, and much more. Business Decision Modeling in Action—Algorithm? What the Heck Is an Algorithm? Business Decision Modeling Behind the Scenes—Business Forecasting—More Art Than Science? Business Decision Modeling in Action—Spreadsheet Optimization Models in Use, or Why Use Spreadsheets to Optimize? John F. Kros has a bachelor of business administration from The University of Texas, a master of business administration from Santa Clara University, and a Ph.D. in systems engineering from The University of Virginia. During his graduate work, he took time out and was employed for several years by Hughes Network Systems (HNS), in Germantown, Maryland. At HNS his responsibilities included: master scheduling, capacity planning, inventory control, and quality assurance/ISO 9000 auditing and training. HNS is a major manufacturer f electronic circuit boards, DSS satellite dishes, cellular phone and switching equipment, high speed cable modems, and network computer satellite systems. John has been in academia for over 17 years and currently is a Professor in the Marketing and Supply Chain Management Department in the College of Business at East Carolina University, in Greenville, NC. Twice he has been awarded the ECU Scholar Teacher Award, 2004–2005 and 2009–2010. He teaches the Business Decision Modeling and Operations and Supply Chain Management courses. His research interests include: Design of Experiments, Multi-Objective Decision Making, Taguchi Methods, and Supply Chain Management Applications. He is a member of the Institute for Operations Research and Management Science (INFORMS), the Decision Sciences Institute (DSI), the Council for Supply Chain Management Professionals (CSCMP), and the Institute for Supply Management (ISM). John has been published in INTERFACES, the Journal of Business Logistics, Quality Engineering, Quality Reliability Engineering International, the International Journal of Production Research, Industrial Management and Data Systems, the International Journal Physical Distribution and Logistics Management, Transportation Research: Part E, Computers and Operations Research, and the Journal of the Operational Research Society and in numerous INFORMS and DSI conference proceedings. He enjoys spending his free time with his beautiful red-headed wife, Novine, and their two beautiful daughters, traveling, snow skiing, spending time with his family and old fraternity brothers, watching college football, and attempting to locate establishments that provide inexpensive food and liquid refreshment. Suggestions are always welcome! !